Honesty is the foundation of every relationship, you can't, in fact, begin any kind of relationship, from being dishonest. Unfortunately, not everyone is that honest so it's quite common that in life you find people betraying you in the worst ways: cheating on you, stealing from you or even "selling" you to someone else. Reading these quotes about dishonesty, you will understand the true importance of what this word means to others and how fundamental it is to be honest in life. There is no kind of dishonesty that does no harm. And the same when you cheat on a boy. Dishonesty has no place to hide. Be careful about the advertisements. Surely, we don't like dishonesty. It might sound exaggerate, but it is actually true. You will definitely find this quote relatable. Sometimes friends are worse than enemies. There's always two faces to the same medal. If you want to have success, you also have to come to terms with this. 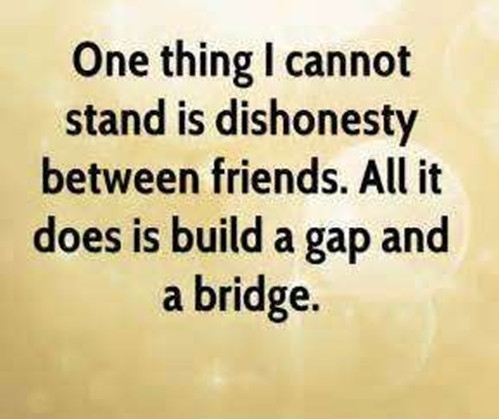 It is true that dishonesty can only bring a gap. But even more often it comes from ourselves' dishonesty. But he that lies will fail in being trusted. It is just a way of deceiving ourselves. Lies are never needed. Never. Small secrets between people are the reason for dishonesty. You are always what you are! How can you not hate this kind of people? Sometimes, honesty hurts people, but dishonesty hurts deeper. Famous words from our list of quotes about dishonesty by Fitzgerald.